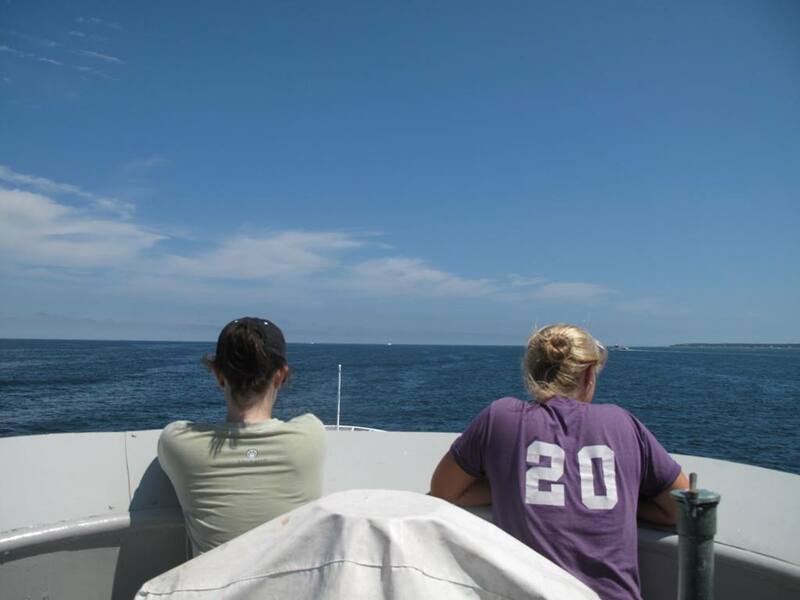 Our departure from Woods Hole has been delayed a number of times due to several factors. We were scheduled to leave the dock on Monday at 2pm, but due to rough seas (8ft on Georges Bank—which was where we were planning to go first) and a crane that needed to be fixed our departure was rescheduled for Tuesday at 10am. On Tuesday, the crane was fixed, but then it was discovered that the ship’s engineering alarm system was not working properly, so our departure was delayed again for a few hours. The crew worked hard to get the ship off the dock and we departed at 1:15 on Tuesday. Yay! We were on our way to Georges Bank, which was about a 15 hour “steam,” or, trip. 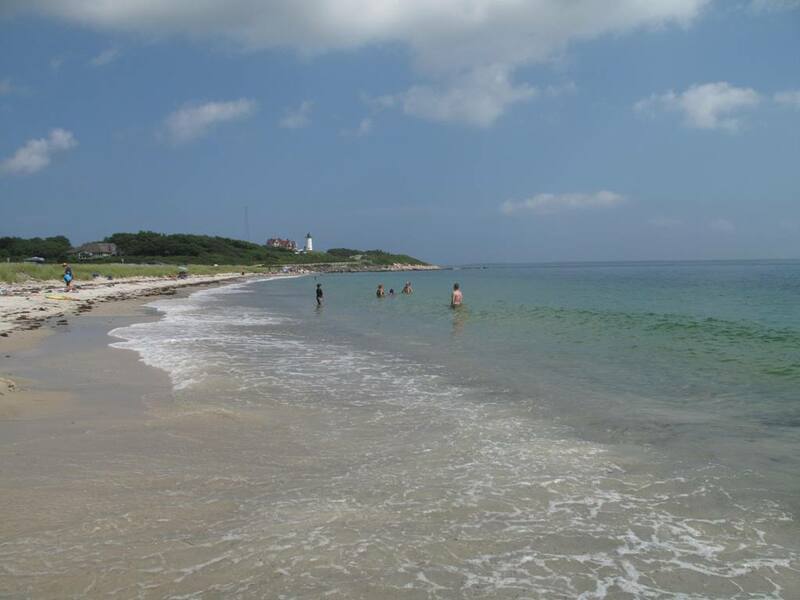 The purpose of the NOAA Fisheries Atlantic surfclam and ocean quahog survey is to determine and keep track of the population of both species. This particular survey is done every three years. NOAA Fisheries surveys other species too, such as ground fish (cod, haddock, pollock, fluke), sea scallops, and northern shrimp. These species are surveyed more often—usually a couple of times each year. Atlantic surfclams and ocean quahogs are surveyed less often than other fished species because they do not grow as fast as other species. In fact, the ocean quahog can live for more than 150 years, but it only reaches about 6 inches across! In comparison, the sea scallop lives for only 10 to 15 years and reaches a size of 8 inches. There are 27 people on board this cruise. Each person is assigned a watch, or shift, so that there are people working 24 hours a day. The work never stops! Seventeen people on board are members of the crew that are responsible for the operation and navigation of the ship, machinery operation and upkeep (crane, dredge, etc. ), food preparation, general maintenance, and electronics operations and repair. There are a lot of things that need to happen to make things on a research ship run smoothly in order for the scientific work to happen! 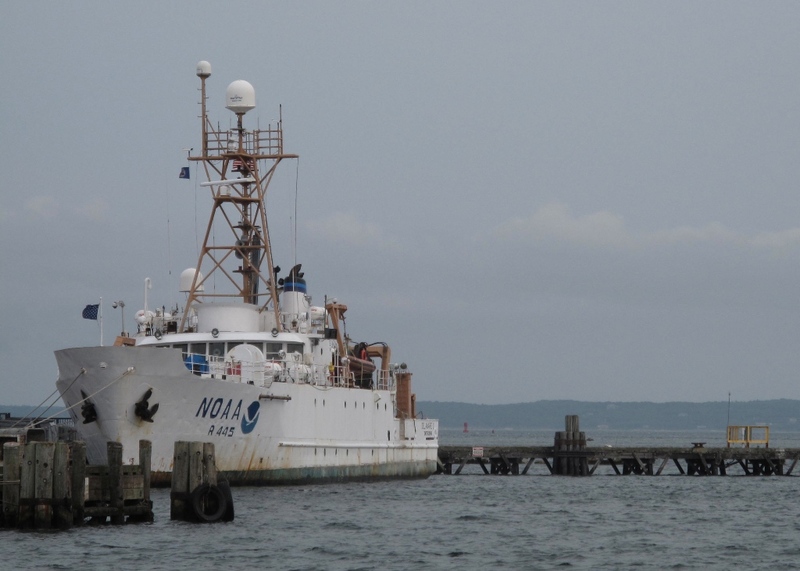 Twelve people on board are part of the science team, including me, who collect the samples and record the data. We are split into two watches, the noon-midnight watch and the midnight-noon watch. We sort through the material in the dredge for the clams and the quahogs. We measure and weigh them as well as document the location where they are collected. Several members of the science team are volunteers. What is the difference between an ocean quahog and an Atlantic surfclam?